Amortization is the act of spreading payments over multiple periods, which is used to pay off the loans and assets. In this method, you have to make a fixed payment at regular intervals for a fixed period of time. There are many software which can be used as Amortization schedule maker software. Although the Amortization charts can also be generated using office suites like OpenOffice, but it requires the knowledge of formulas that have to be incorporated in the sheets, which may be little problematic for a few. Should I take this loan? Will the EMI be affordable? How long will it take to clear the loan? 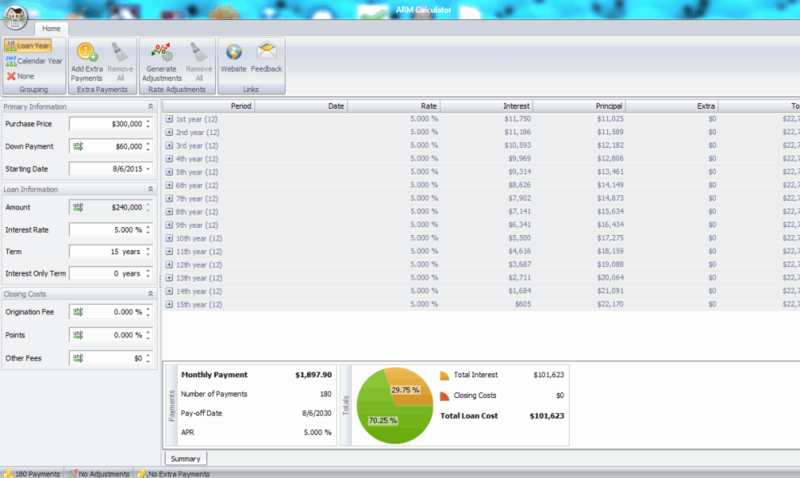 Although all the software enlisted here are pretty good and quite easy to use, I personally like Loan*Calculator! Plus the most. This is due to its sleek and easy to use interface. You simply need to enter the loan details. The most amazing feature in it is that you can select from a wide list of options of payment period, compounding period, and amortizing period, which is not available in some of the software. Loan*Calculator! Plus is a sleek software used as Amortization Schedule Maker. In this, you have to simply enter the amount of loan, initial periods, annual rate, periodic payment, origination date, and first payment date. Select from the list of options of payment period, compounding period, and amortizing method using drop down menus. Based on this input data, Amortization schedule table is generated, which displays the date of payment, payment, principal, interest, balance, annual totals and running totals. 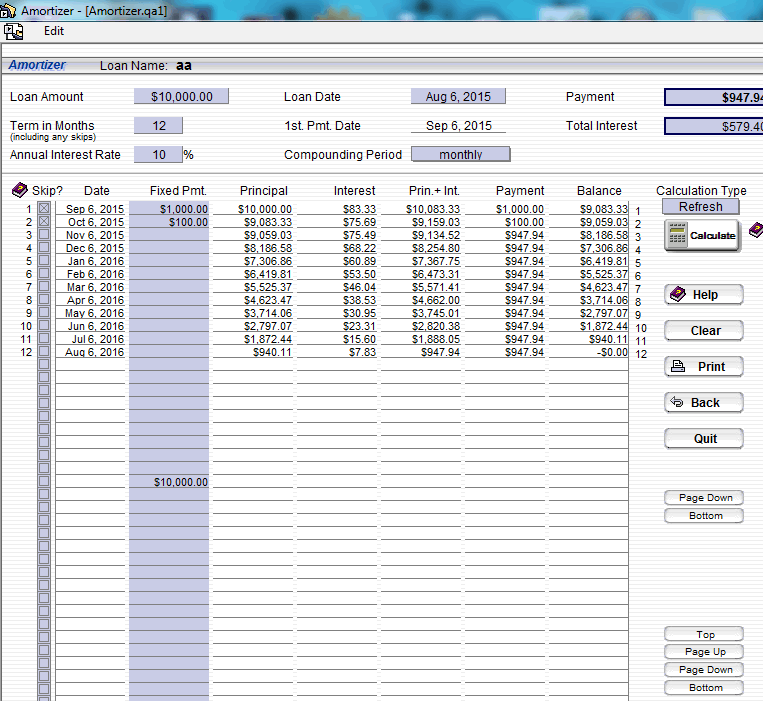 Using this freeware amortization schedule maker, you can save your data and take its printout. The layout of this software can be Personalized by choosing from a list of beautiful skins, and selecting the options to use when the calculator opens, i.e. last entered calculation or defaults. In default, you have the option to select either publisher's data, global data, or local data values. It can also be used for various other loan calculations like accelerated payment, automobile loan, balloon payment, compound/simple interest, loan, mortgage loan, refinance loan and refinance advice. Microsoft Office Excel is the most widely used office suite. It can be used to create amortization schedule, but involves the knowledge of formulas. In order to simplify this process involved there are a number of excel templates which can be used to easily create amortization schedules. In this I have used Home Mortgage Calculator. You have to simply enter the details of your mortgage like loan amount, annual interest rate, term length, first payment date, compound period, payment frequency. Details of any extra payments can be entered, like: start at payment number, extra payment amount, payment interval, extra annual payment, and also choose the option of the fixed rate, or variable rate. Based on the entries it displays the monthly payment, total extra payment, interest savings, number of payments, last payment date, total payment, total interest, etc. In order to view the balance of a specified year you need to simply enter the year, and the details display the date, interest paid, principal paid, and outstanding balance. 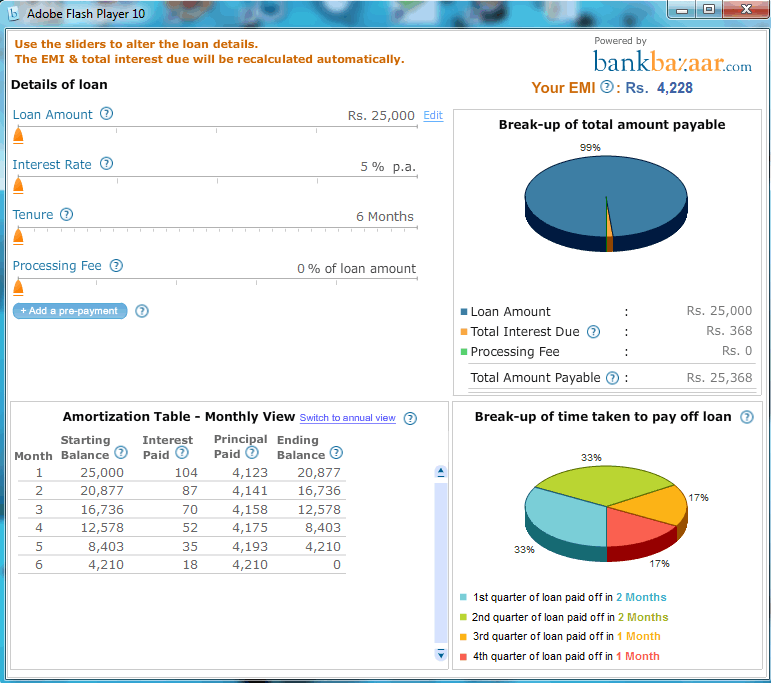 The details of extra payments, and the balance is shown in a graphical format. In case of any tax deductions it can be entered in the tax bracket. The amortization chart displays the payment date, interest rate, payment due, extra payments, additional payments, principal paid, balance, tax returned and cumulative tax returned. The final details can be exported as excel files, workbooks, webpages, TXT, and CSV. It also lets you view and edit the template and view the changes incorporated. ARM calculator is a very simple looking, easy to use informative software used to create amortization charts. To do so, you simply need to enter details of your loan, like: purchase price, down payment, starting date, amount, interest rate, term, interest only term, origination fee, points, and other fees. Some of the tabs display unit in it, where you can select the option to change it as percent of purchase price, or absolute value. Based on the data entered, the amortization table is generated. The amortization table displays the period, date, rate, interest, principal, extra, total, and balance, which can be grouped as per loan year, calendar year, or left ungrouped. The amortization chart is also generated which displays the total interest, closing costs, and total loan cost. In the amortization table generated, you can also change the rate, and extra details to view the changes. In case you make any extra payments, you can easily add them and view the results displayed. In the add extra payments tab, you have to set the frequency for the payment, period of payment, and the amount of extra payment. While selecting extra payments, you are also shown the interest savings on your loan. In case of any adjustments for the loans, you can also select the adjustment properties of your loan, like: fixed rate period, first adjustment date, adjustment frequency, expected adjustment, and interest rate cap. Then you can also set the interest rates and select how much is to be paid on certain dates. OpenOffice Calc is a very powerful software that can be used to generate amortization chart. There are a lot of tutorials available to help you generate amortization tables. Along with it there are a number of templates available which can enable you to easily create the amortization table. I have tried the LoanMeister template, which is available for free to be used to generate amortization tables. In this amortization schedule template for OpenOffice Calc, the information to be entered is grouped in three different tabs, i.e. : Required data, totals, and sub totals. In the required data tab, you have to enter the principal, interest rate, loan term, and date of first payment. Then the average monthly payment, total principal, total interest, total amount, and extra paid is calculated. You also have the option to make edits to sub-total, where you have to enter starting payments. 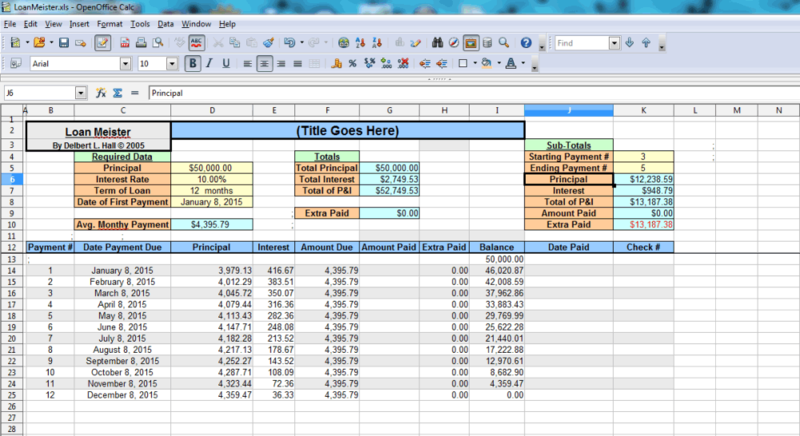 This in turn gives the details of the sub-total; displaying principal, interest, amount, amount paid and extra paid. The Amortization chart displays the payment, payment due date, principal, interest, amount due, amount paid, extra paid, and balance. The edits can be made to the amount paid and date paid. Based on the edits, later data is generated. The generated data can be saved as XLS, XLT, ODS, OTS, SXC, STC, PDF, etc. Some of the cells are unlocked while others are locked. You are not allowed to change the entries of the locked cells. You cannot see or change the formulas used in the spreadsheet, which is for the safety of the document, so that it is not altered. 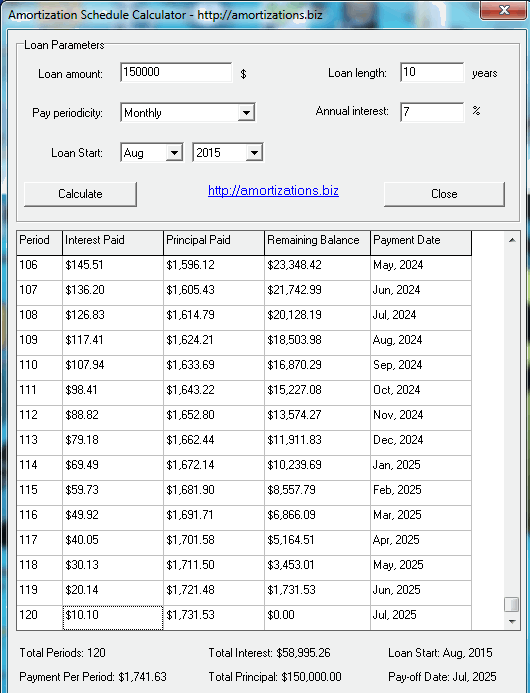 Amortizer is a freeware with sleek design to prepare amortization tables. In this you have to enter the loan name, and then you are to enter different loan details, like loan amount, loan term in months, annual interest rates, loan date, first payment date, and compounding period. 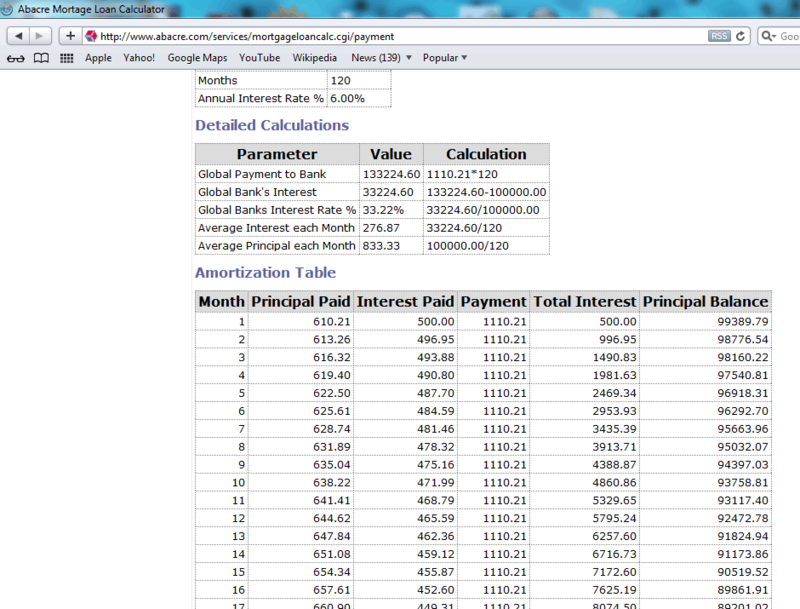 Then when you select the option to calculate, it shows payment, total interest, and amortization table is generated. The amortization table displays the installment number, date of payment, fixed payment, principal, interest, amount, payment, and balance. In the amortization table, you can select the option to skip the installment, and also insert the amount of fixed payment. Based on the new entries, Amortizer also generates new data for the payment, and total interest. You can also take a printout of the generated data table. Amortization Schedule Calculator is a free and basic software used to make Amortization tables. Add details like loan amount, loan length, payment frequency, annual interest rate, and loan start date. 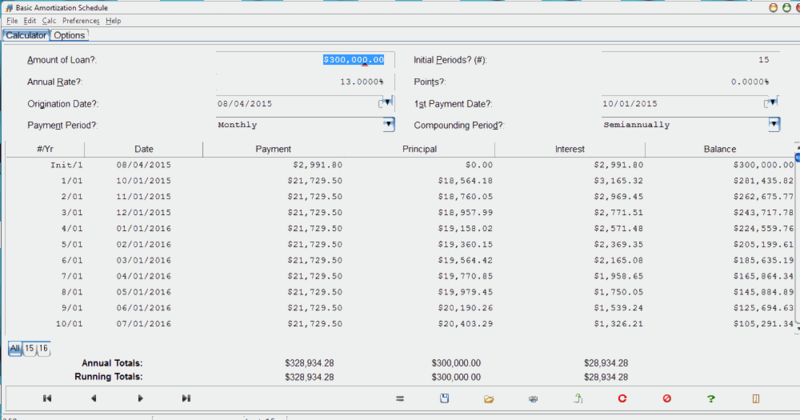 Then after you click on the calculate button, it generates an Amortization chart displaying the period, interest paid, principal paid, remaining balance, and payment date. At the bottom, you can see total periods, total interest paid, payment per period, total principal, loan start date and the pay-off date. EMI Calculator Plus is a simple flash player which is used to calculate the EMI rates of the loan. In this you have to simply move the slider to select the loan details, like: loan amount, interest rate, tenure, and processing fee. Based on your selection the EMI, and Amortization table with monthly view or annual view is generated. 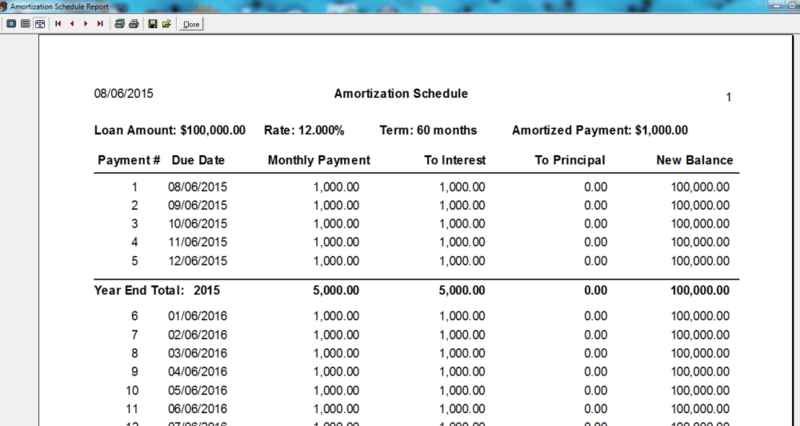 The amortization table displays the starting balance, interest paid, principal paid, ending balance, and prepayment. The break-up of total amount payable, and break-up of time taken to pay the loan is generated in a graphical format, with relevant details. The option to add a prepayment amount is also available, where you can choose the option to make pre-payment, or pay-off the loan completely. Based on the pre-payment option you selected, it displays the benefits of the pre-payment and the total amount paid in both the scenarios. The knowledge of how much will you save on the prepayment is also displayed. ARK Lender Calculators is a simple and easy to use freeware which can be used to prepare amortization schedule. To prepare an amortization schedule you need to enter the loan amount, interest rate, loan term, payment, and first payment date. You have the option to select the no of payment details to be printed. 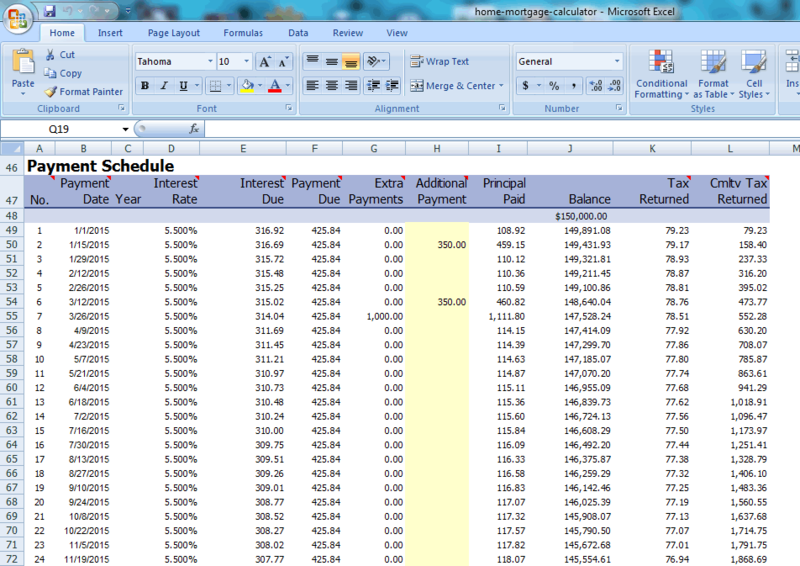 Then when you click on preview it generates the amortization schedule report. This contains due date, monthly payment, interest, principal, and new balance. Also year end total reports are generated at the end of each year. You can take a printout of the generated table, or save it locally as QRP. Using this freeware you can also do other useful calculations like payment calculation, APR calculation, days between dates, loan servicing, and help you decide whether you should take a loan or not. Compound Interest Calculator is a very basic software, which can be used to create amortization tables. To use this feature, you have to click on Loan repayment find payment amount. In the new window that opens, you have to insert the values of Initial loan, period, interest rate, interest duration, and repayment frequency. 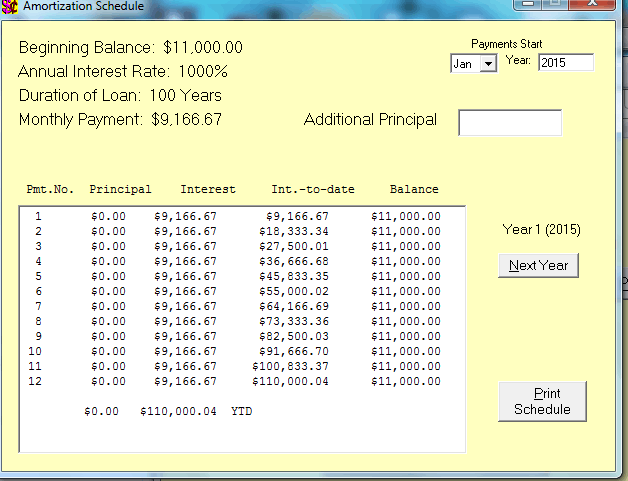 Based on the data entered, it displays the repayment amount, interest amount, and total amount. If any repayments have been made, they can be added. Based on your requirements, different options can be selected to prepare different types of charts, displaying: Balance, interest paid, original loan, total cost, balance loan, etc. Different formulas used in the software can be viewed and the data can also be copied to the clipboard. Amortization table is displayed in the form of year by year table. There are also different other tools which can be used to calculate future value of initial deposit, future value of regular deposit, regular withdrawls from account, and loan repayment final amount and period. Payment: What is monthly payment if I take X loan on Y rate during Z months/years? Principal: How much can I handle if I can pay X each month during Y months/year at Z annual rate? Periods: How many months/years should I pay X loan at Y annual rate with Z monthly payments? Based on the questions you have to insert the details of Loan Amount, Annual Interest Rate, Loan term, or Monthly Payment; and then click on the calculate button, after which it shows the missing answer. Although this software doesn't display the amortization table, when you close the software then you are directed to its website, where the option is provided to generate the amortization table. The website displays Calculated data, loan summary, detailed calculations, amortization table, and annual amortization table. The amortization table displays the principal paid, interest paid, payment, total interest, and principal balance. Amortization and Annuity Calculations is a simple and easy to use software used to generate Amortization schedule. In order to generate the Amortization schedule, you simply have to input the loan details, like: initial balance, annual interest rate, duration of loan in months/years. The moment you enter the last entry, the calculated regular payment, total of payments, and total interest paid is displayed. Then after you click on the amortization schedule button, a new window is displayed, showing: payment numbers, principal, interest, interest to date, balance, beginning balance, annual interest rate, duration of loan, and monthly payment. Additional principal amount can be added, which further shows the interest savings on prepayment, and the duration of loan is adjusted accordingly. You can also take a printout of the amortization schedule if required. 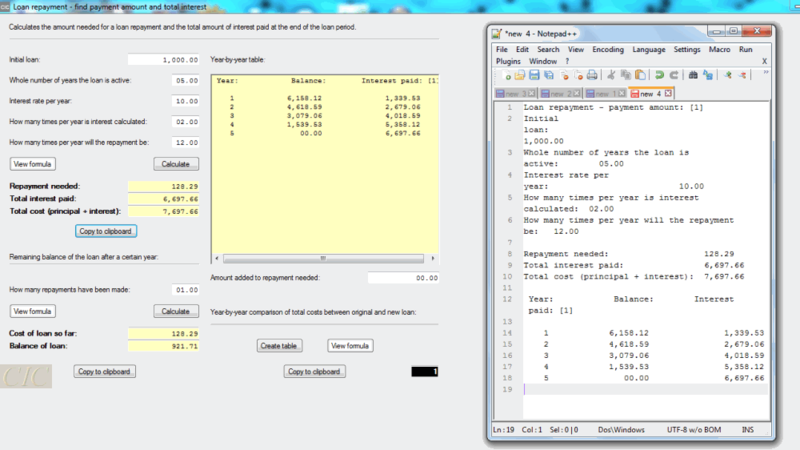 This freeware can also be used for annuity calculations.